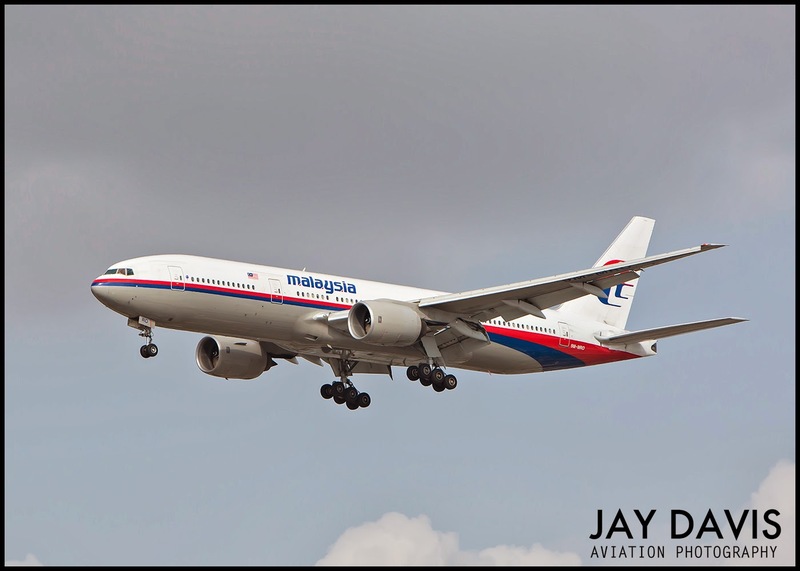 9M-MRO shot by Jay Davis at LAX last year. Writing from Kuala Lumpur, Malaysia -- The lowly satellite pinger, a humble device designed to make sure that expensive satellite communication time is not wasted, is having its day in the sun as the mobile communications company Inmarsat, gets called in to help find the missing Malaysia Flight 370. In an announcement this afternoon at the Sama-Sama Hotel at Kuala Lumpur International Airport, Malaysian Prime Minister Najib Tun Razak said evidence increasingly suggests that the Boeing 777 with 239 people on board has been hijacked. Further, the once-an-hour pinging between Inmarsat's satellite network and the plane with the registration 9M-MRO, indicates Malaysia Flight 370 flew for at least six hours and fifty minutes after disappearing from radar off the northern coast of Malaysia at 1:21 a.m..
"The last confirmed communication with the satellite was 8:11 a.m." Malaysian time, Mr. Najib said. With only primary radar to help them try and figure out where the plane flew after the transponder was turned off, authorities turned to their attention to the pinger data, with the idea that by determining which of several satellites transmitted the plane's signal as it moved, they could get a general idea of the plane's path compared to the information from the primary radar targets. The investigators have not released the course they think the airplane flew, though some news outlets have quoted unidentified sources as saying it flew a winding route toward the southeast. After telling reporters that police would begin a more serious review of everyone on board the plane with an eye toward who might have hijacked the flight, the Prime Minister then proceeded to outline an even larger search area in the ongoing effort to find the plane. Fourty three ships and 58 aircraft from 14 countries will now be redirected to an area of search extending from Khasikstan to Thailand and Indonesia to the South Indian Ocean. Yesterday I posted this spoof graphic. Today it is not too far from reality. Meantime the folks at Inmarsat, can be compared to the brainy bespectacled girls at the dance. Toiling for years selling a valuable but technologically complicated service, all of a sudden they are in demand. Everybody wants to talk to them. When I called the company for details on this unconventional use of airplane monitoring, David Coiley, business director for the aeronautical division told me, "We have been asked to be a technical advisor to the Air Accidents Investigation Branch," he told me, "and we are unable to comment further." The AAIB along with the American National Transportation Safety Board and the Federal Aviation Administration have all contributed expertise and advice over the past week, the Prime Minister said. Several days ago, I pointed out the Twitter paradox of our age. We are so reliant on a constant and never ending flow of information. Mysteries like the disappearance of Malaysia Flight 370 are not only intolerable, they are unfathomable. Then, we discover some tiny shred of information was there all along. Seven days, countless theories, little progress. This tiny development from an unexpected source could be big. "Beware the Ides of March" - Geeks Shall Overcome! Amazing blogs you have guys!! Keeps the ball rolling…..